Welcome to the Barr Foundation Knowledge Center, powered by IssueLab. This collection features key learning and work from our partners to maximize impact in our issue areas and the broader field. Learn more about this collection with "About this collection" and explore the knowledge center below. In 2017, the Barr Foundation launched Engage New England (ENE), a signature initiative that provides a unique opportunity for local education agencies and nonprofits to plan for and develop innovative schools designed to serve students off track to high school graduation. School design partner Springpoint is leading three cohorts of grantees through a three-phase planning year: Understand, Design, and Build. During the Understand phase, grantees conduct research to understand the needs of their student populations. In the Design phase, the grantees design a school model to meet those needs; planning to launch that model begins in the Build phase. The first cohort of grantees received planning year grants for the 2017–18 school year and included a combination of new schools and school redesigns. During the planning year, these grantees assembled teams to lead the design work, collected and analyzed data to learn about their current or potential students and community needs and capacities, articulated design priorities, and began to plan for the launch of the new or refined school model. SRI Education, the research partner for the ENE initiative, captured the learnings from the planning process through interviews, classroom observations, and student focus groups conducted during March and April 2018. The findings in this brief are based on the reflections of the school and design leaders and staff members involved in the design process as well as Springpoint staff members who supported the design process. This brief is designed to benefit all three cohorts of ENE grantees as they plan and build their schools and to highlight key elements of planning for innovative school models. As home to America's first subway, Boston has been a transit-oriented city for more than a century. In fact, much of our regional economic success is due to the connectivity that a transit system provides. It is no coincidence that the area served by the MBTA houses almost 70 percent of the state's population, offers 74 percent of the jobs, and generates 84 percent of Massachusetts's gross domestic product. The MBTA is the backbone of our economy and any successful strategy for continued growth and prosperity for the region must begin with smart investment in this system. Luckily, the calculus is straightforward as the benefits from our transit system far outweigh the costs we dedicate to support it. A new report from A Better City, made possible through support from both the Barr Foundation and The Boston Foundation, measured the MBTA's performance and economic impact. 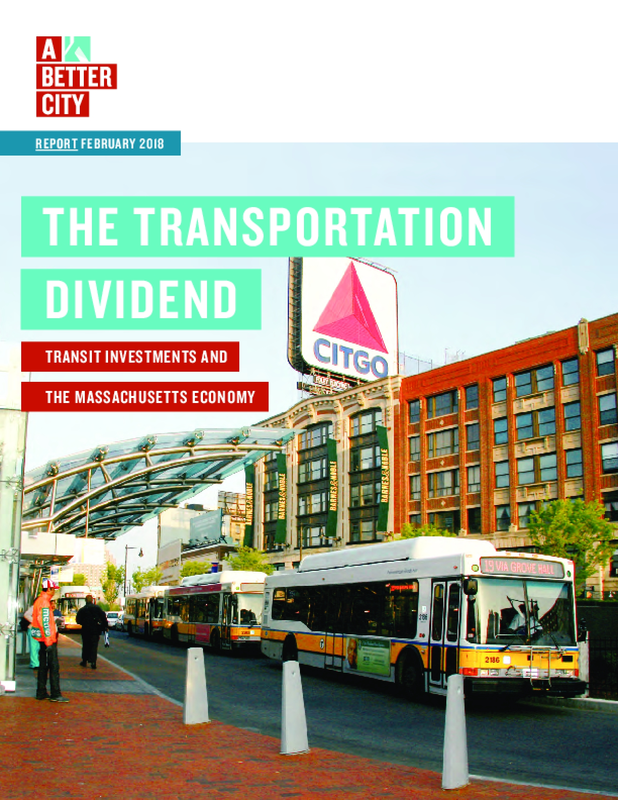 It found that through travel time and cost savings, vehicular crashes avoided and reduced auto emissions, the MBTA provides an estimated $11.4 billion in value to Greater Boston each year for both transit users and non-users alike. Boston residents experience all of these benefits from the T's annual operating budget of approximately $2 billion. The report also considered the alternative, examining what would it cost if our transit system did not exist. Our economy would require the capital cost of nearly 2,300 additional lane miles of roads and 400,000 more parking spaces. If we needed to build that today, the cost for this vehicular infrastructure would be over $15 billion. The MBTA is a bargain today and for the future. Community Choice Energy (CCE) allows a municipality to purchase electricity from a competitive supplieron behalf of participating electric customers. CCE would allow Boston to pool customers together, using this greater bargaining power to benefit customers in the City. In addition, through CCE, the City would purchase at least five percent more Class I renewable energy than required under the Commonwealth'sRenewable Energy Portfolio (RPS) law. Currently, 127 cities and towns Massachusetts have adopted CCE—more than one-third of the 351 municipalities in the Commonwealth. Many municipalities that implement CCE procure five percent more renewable energy than is required by the Massachusetts RPS. Some are going even further, such as Brookline, which is purchasing 25 percent more renewable energy than required, and Greenfield, which is purchasing 100 percent renewables. This report reviews commonly asked questions that the City should consider as it assesses whether to adopt this policy. 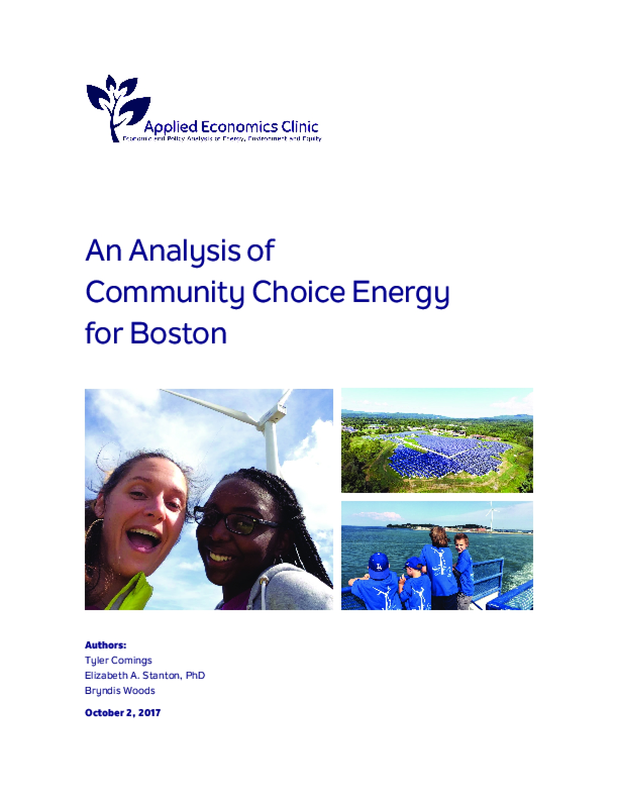 A Better City facilitated the formation of a team among three of its members – the Massachusetts Institute of Technology, Boston Medical Center, and Post Office Square Redevelopment Corporation – to purchase the output of a large-scale renewable energy facility. This aggregation was unique in the diversity of the partners, the scale of the project, and the mutual benefit to all parties involved. 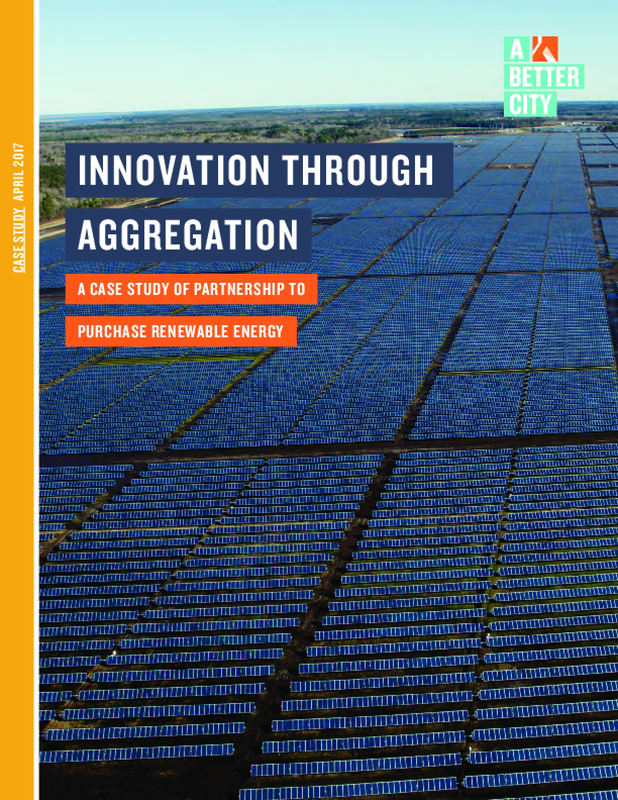 This case study provides lessons learned for organizations interested in aggregating the purchase of renewable energy including: the benefits of renewable energy beyond environmental impact; the value of partnerships and collaboration to yield results; the organizational flexibility gained through renewable energy purchasing; and the necessity for ongoing recruitment and anchor partners. Study Overview Personalized learning is often equated with individual learning using technology. Yet for many students, learning on their own may not effectively meet their needs. The aim of this study was to explore racial differences in experiences and benefits associated with collaboration. 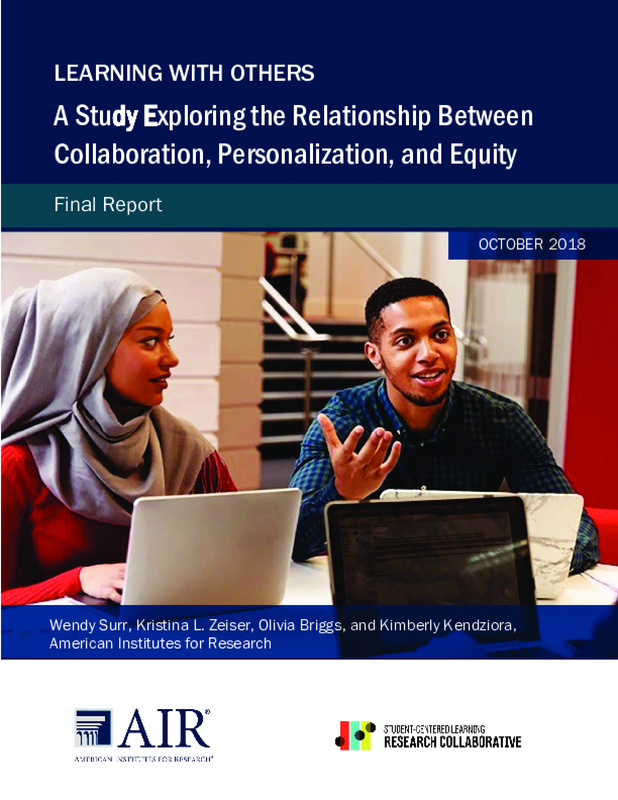 We collected data from a variety of sources for students, teachers, and classrooms within four racially diverse high schools that emphasized both personalization and collaboration. Our sample included 892 students, 138 teachers, and 30 classrooms. Our qualitative analyses identified emergent themes from focus groups and interviews, and our quantitative analyses examined associations among opportunities for collaboration, classroom experiences, and outcomes, testing whether these associations differed forBlack students versus White students. We found that, for all students, reports of high-quality collaboration were strongly associated with positive classroom experiences and mind-set/ dispositional outcomes such as motivation, engagement, and self-efficacy. Moreover, high-quality collaboration was strongly associated with students' perceptions of personalization—and personalization, in turn, was strongly associated with outcomes. At the same time, focus group discussions revealed that Black students perceived less relevance in collaborative activities, more frequent experiences of exclusion and marginalization, and lower support from teachers during collaborative group work than did non-Black peers. Findings from this study suggest that collaborative experiences could be among the factors that contribute to positive changes in the academic trajectories of Black students, particularly when these opportunities reflect high-quality features. Thus, schools and educators aiming to address equity through personalization should consider increasing opportunities for high-quality collaboration. Student-centered learning encompasses four overlapping and complementary principles (JFF, 2014): competency-based progression, personalization, flexibility in where and when learning takes place, and facilitation of key skills and dispositions such as agency and ownership. To date, few studies have attempted to quantitatively characterize implementation of student-centered learning in order to investigate the relationship between variability in implementation and student outcomes—particularly outcomes among high-need student subgroups (Steele, Lewis, Santibañez, et al., 2014). 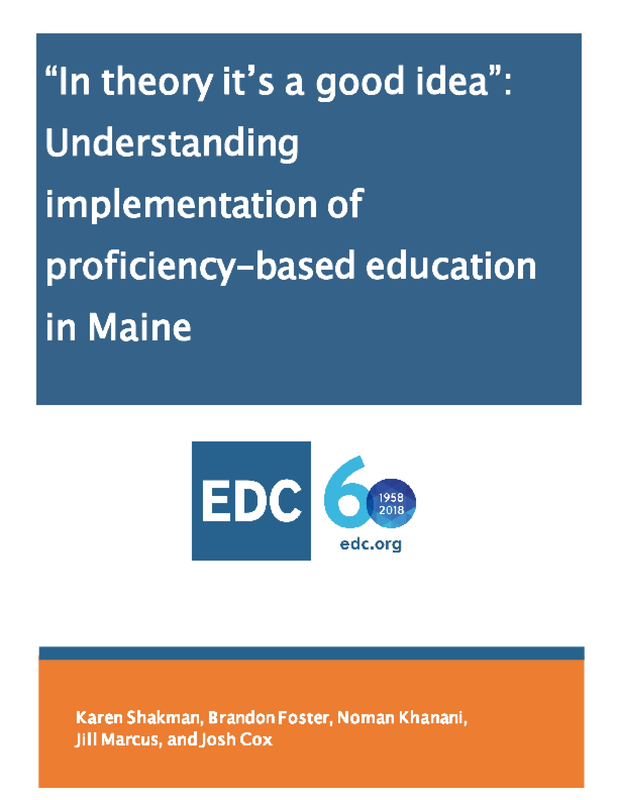 Education Development Center (EDC) partnered with 10 districts in rural Maine that were in the process of implementing the state's requirement that students graduate with a proficiency-based diploma, to study students' exposure to student-centered, proficiency-based education and the relationship between exposure and student academic performance and engagement. Using Latent Profile Analysis, a statistical technique used to uncover hidden subgroups (i.e., latent profiles) based on the similarity with which a group of individuals responds to a set of survey questions, we found that three distinct proficiency-based education (PBE) exposure profiles existed, in similar proportions across all the participating schools and within every school. Analyses of district level administrative data showed that having an IEP was associated with higher exposure to PBE practices but that other student characteristics, including free and reduced-price lunch status and gender were not associated with more exposure to PBE practices. We also observed a positive relationship between exposure to PBE practices and increased levels of student engagement, and a negative association between exposure to PBE practices and SAT scores. Finally, qualitative analyses revealed that implementation to date has largely focused on identifying graduation standards and implementing new proficiency-based grading practices, with traditional classroom practices still fairly commonplace. 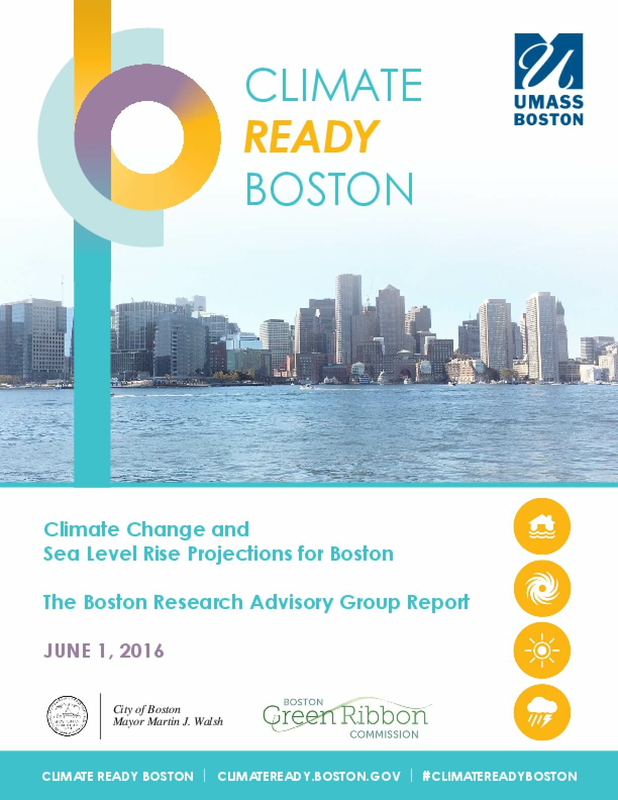 As this report indicates, implementing CRB is necessary but not sufficient to prepare Boston's built environment for the freshwater and coastal flooding anticipated to result from climate change. Additional steps we must take include reforming existing tools, monitoring and evaluating flood adaptation activities, and establishing governance for district-scale coastal flood protection implementation. 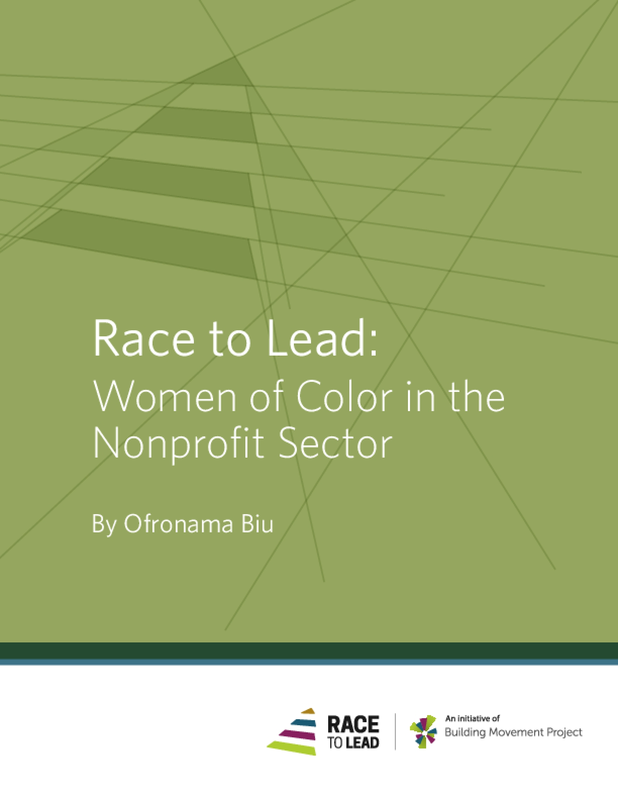 This report presents an array of options for moving forward. Over the next year or so, the City and relevant stakeholders will need to come together and decide which, if any, of these options provide the best paths forward for a more resilient city and region. We recommend that the Governor of Massachusetts and the Mayor of Boston establish a joint commission to explore the options and determine a path forward. There is an opportunity for us to learn from the transition to clean energy as we prepare for climate change impacts. We recommend that the legislature take a leadership role in this effort as well, in order to evaluate the different options available to the Commonwealth as we attempt to address this dynamic challenge. 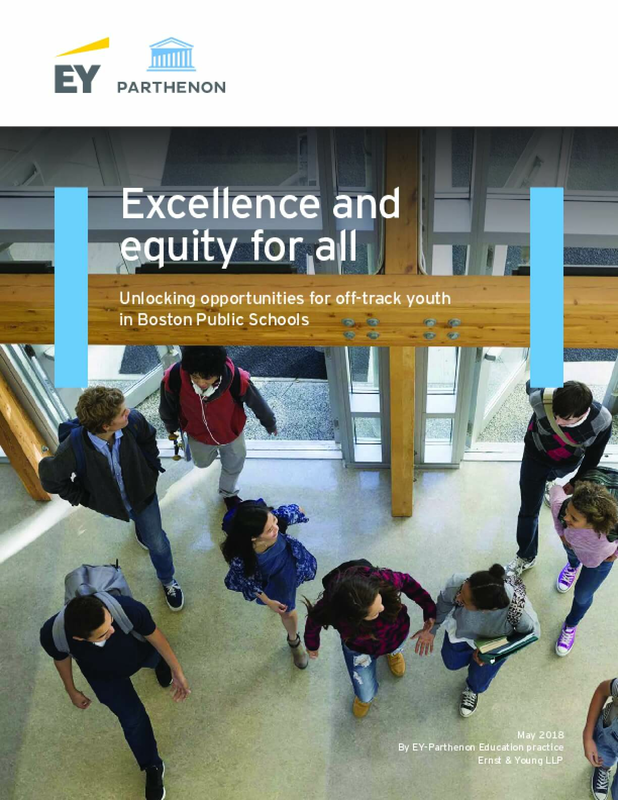 In 2007, Boston Public Schools commissioned a report from EY-Parthenon to examine how the district was serving youth who were off-track to graduate from high school. That examination of the dropout pipeline revealed a serious need for improvement and was followed by investments in some crucial areas, and in alternative education in particular, to better serve our youth. Since then, significant efforts have been made by BPS and by the Boston community as a whole to support all of our students not just to graduation, but also to a fruitful life after high school. Thanks to these concerted efforts, the BPS four-year graduation rate has risen from 57.9% in 2007 to 72.7% in 2017. Over the same time frame, the annual dropout rate has fallen from 7.9% to 3.6%. But these improvements are not enough. With that in mind, last year I commissioned a second report to update our understanding of how our secondary schools support our youth who are off-track to graduate. With support from the Barr Foundation, EY-Parthenon has worked tirelessly to identify patterns of when, why, and how students fall off-track to graduate, as well as which early warning indicators might help us see which students are at risk to fall off track.The results of this study support what we suspected: (1) some of our own policies are contributing to the inadequate service for our youth and (2) our practices are not yet sufficiently developed to prevent students from falling off-track or to help them recover fully if they do. I concur fully with the findings and recommendations presented in this report. BPS will act decisively and with the support of our partners to implement these recommendations. We must be bold, not incremental, so that we see significant change following from this report. This report has given BPS a strong foundation and clear direction from which to act. I have directed staff to develop an initial response to the report including a set of actions that can be taken immediately. I will also convene a steering committee to formulate a longer-term strategic plan to address each of the findings and the recommendations and their implications in detail. 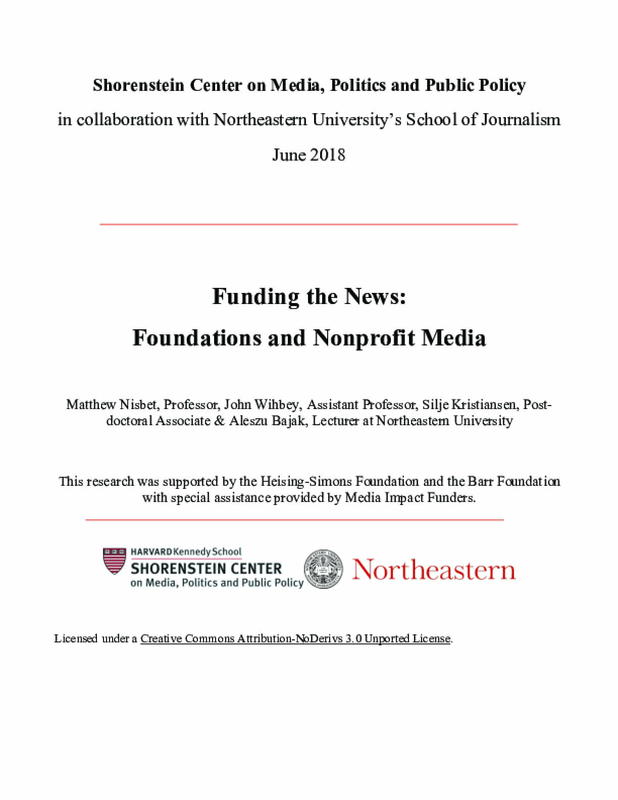 My team and I are extremely grateful for the generous support from the Barr Foundation that enabled this crucial analysis. We are equally grateful to the EY-Parthenon team for their dedication to rigorous and honest analysis. Our commitment is to dramatic, not incremental, change. Gateway Cities can accommodate thousands of new housing units and thousands of new jobs on the vacant and underutilized land surrounding their commuter rail stations. This walkable, mixed-use urban land offers an ideal setting for transit-oriented development (TOD) to take hold. Currently, Gateway City commuter rail stations get minimal ridership from downtown neighborhoods and few developers seek out this land for TOD. 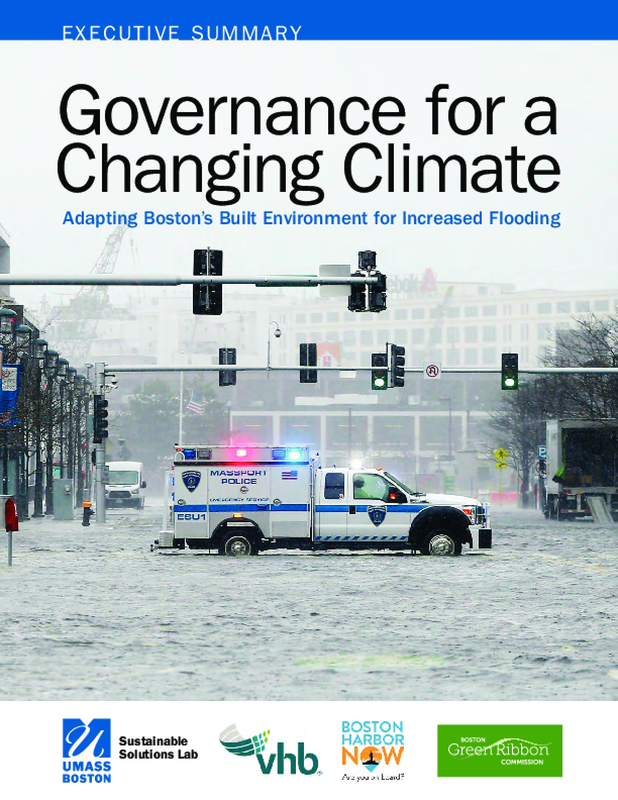 But changing economic forces may provide opportunities to funnel future development into transit-connected Gateway Cities, generating more inclusive and economically productive growth, reducing road congestion and greenhouse gas (GHG) emissions, increasing housing supply, conserving open space, and improving quality of life in communities throughout the Commonwealth. With generous support from the Barr Foundation, this groundbreaking MassINC research explores the opportunity for TOD in regional urban centers with varying market contexts and estimates the positive outcomes possible if we realize the development potential for TOD in these cities. 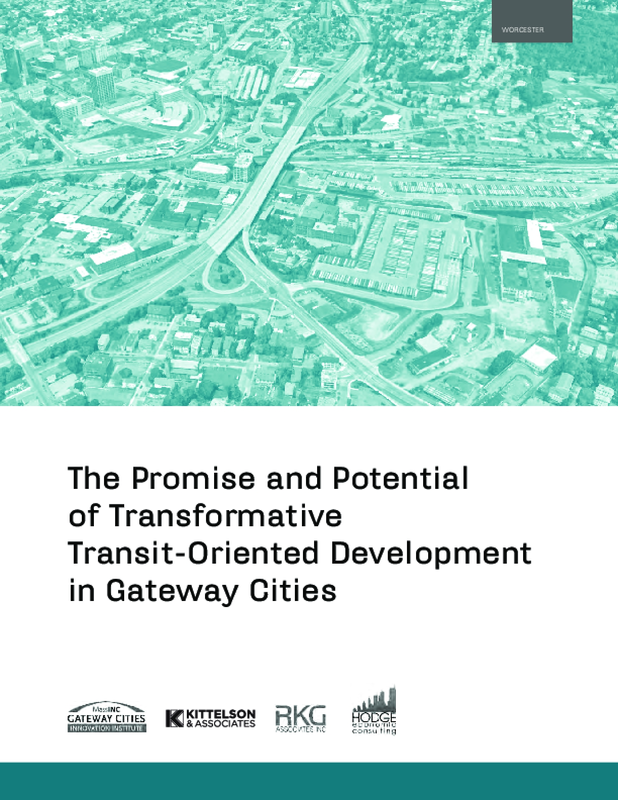 The report concludes with a strategy to help Massachusetts capture the promise of Gateway City TOD. This collection includes publications and resources from our partners and in our program areas, both current and legacy. These resources are completely free to access and download. Most of these works were funded by the Barr Foundation. We may occasionally feature items relevant to our program areas which were not funded by Barr. Please be aware that views expressed are not necessarily those of the Barr Foundation. We encourage you to search our collection and suggest potential content to include (use "Suggest an Addition"). For questions or assistance, please contact feedback@barrfoundation.org.